I am hanging my head in shame. Not really, but I kinda feel like it. Today, I am going to share with you, my sweet Dirt Roaders, something ridiculous. 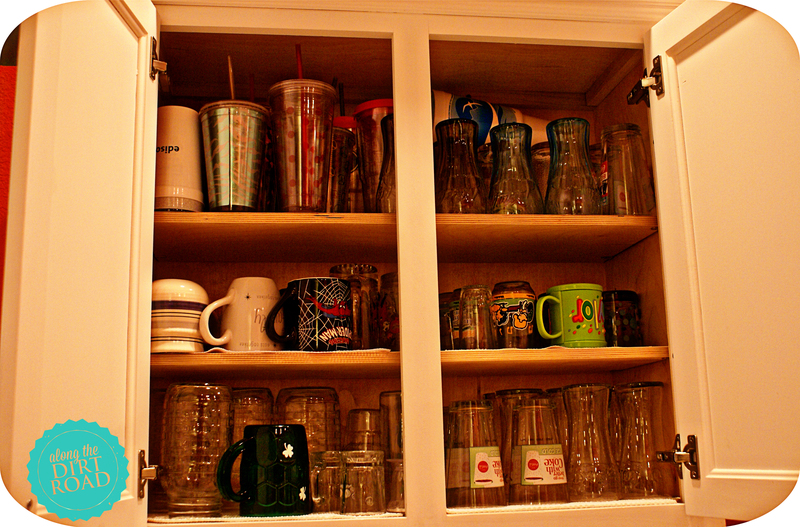 It is our glass and cup collection. Really now? A family of five need a bazillion and a half drinking glasses and cups? Please tell me that we are joking. It’s nuts! 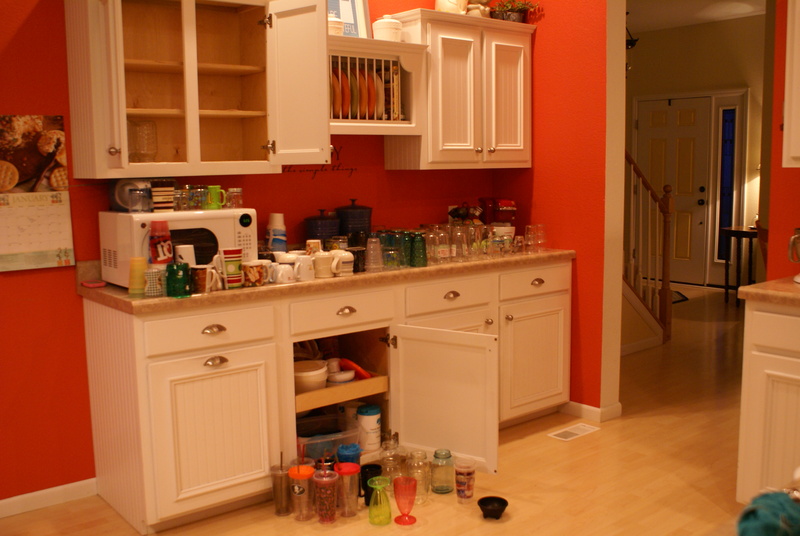 It will be so nice to unload the dishwasher and not have to fit the glasses in like puzzle pieces! (I lost my edited version somewhere…pretend my badge is on there.) Sheesh…look at all of those cups and glasses and doesn’t include stemware! 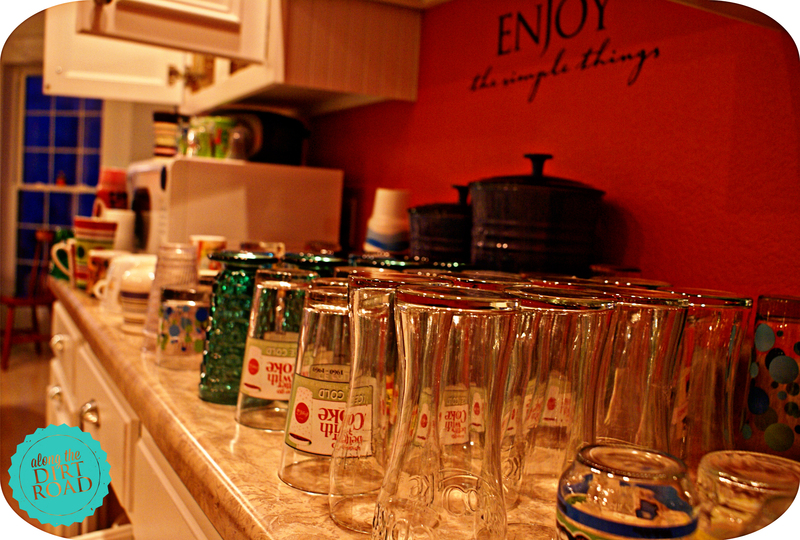 Really though…that does not mean that we need all of these cups and glasses. Remember when I mentioned the January Purge to you? Well…it has happened at our house. Our first major phase. It is wonderful. I do have to say, that my Mr. did the boxing up while I was cooking pancakes and bacon and eggs. He asked if things got to stay or had to go. It’s so easy for him. (I spied those little Tupperware tumblers that our babies used to drink their milk out of at snack time…but I left them in the box. *sniff) While this was going on, I was consoling myself in my mind, that they would still be in the basement in the box. Get a grip woman! I hope that you have a wonderful weekend, Dirt Roadikins. (My spell check doesn’t recognize “Roadikins” and suggests goatskins. I would never call you Dirt Goatskins.) May you squeeze your loved ones extra and make wonderful memories…over glasses of sweet tea! I have one question……????? Why did you keep the styrofoam cup laying sideways on top shelf???? :) Just had to tease you a bit! LOL Have a great day! Sherri….THAT is your NEPHEW’S doings! LOL! I wondered if anyone would notice. You know R. if he can save a penny or two…he’s gonna keep that cup! 😉 Thanks…you have a great one too. ~k. Lol your blog always makes me laugh! I feel like I’m having an actual conversation with you! Your writing is so natural and pleasant. Now for this purging!! Love it! I am purging as I’m packing and I will purge some more when I unpack!! It feels great! Btw…lil tumblers…hmmm…nevermind-NO-I will not offer to take them from you! 😉 We are past that too-we are purging not getting more!! Maranda…thank you…thank you …and thank you. 😉 Love you bunches girl. We can do it! (I say this…even though I went to Big Lots yesterday. :/) k.
Love to read these! I feel like we are at Granny’s chatting with a tub of dip & chip!!! I’ve got to purge….a LOT of stuff!! I always feel so clean & lighter after the transition! Candy….thank you. I am glad that you enjoy. 🙂 If we can’t be at Granny’s more often than we are…maybe these will help. 😉 Good luck with your purging. 🙂 I feel that way too…when I’m done. Love you bunches! k.